Watch Elaine Pagels on the Book of Revelation on PBS. See more from Religion & Ethics NewsWeekly. Throughout her career as an historian and biblical scholar, Elaine Pagels has been piecing together the process by which many different writings inspired by someone named Jesus came to be singularly known as The Bible. By proxy, that process tells the story of how the disparate devotees of Jesus came to form a singular institution we know as the Christian church. In the centuries since, the interpretations of that book by that institution (or fragments of it), have heavily influenced history. Better understanding these parallel coalescences of text and tribe, as Pagels’s work has shown, can teach us about more than just some of the events of the first few centuries CE, but of balancing individual empowerment with group identity, the formation of orthodoxy, and the enduring power of a good story. One of Pagels’ most popular books, Beyond Belief: The Secret Gospel of Thomas explores the cache of texts discovered near Nag Hammadi, Egypt in 1945. In it, she focuses on The Gospel of Thomas, which was written sometime between 40 and 140 CE. Of interest is the text’s interpretation of the salvation offered by following Jesus. Referencing a “light within each person,” this apocryphal gospel eschewed the “one true path” rhetoric that would eventually be incorporated into the official church doctrine for an Eastern-sounding individually achieved enlightenment. More recently, Pagels explored writings attributed to Judas that also didn’t make it into the doctrinal Bible and that similarly contradict official teaching. She discussed Reading Judas: The Gospel of Judas and the Shaping of Christianity with Stephen Colbert in 02007. 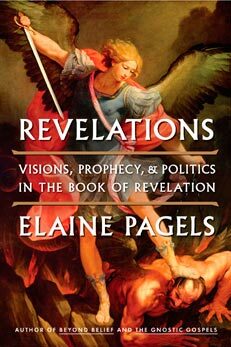 In her latest book, Revelations: Visions, Prophecy, and Politics in the Book of Revelation, Pagels turns her attention away from rejected and suppressed texts for one of the most popular and cinematic Biblical passages – The Book of Revelation. The historical record seems to indicate that it was written by John of Patmos to express the horror of the Roman army’s destruction of Jerusalem in 70 CE. The author couldn’t openly demonize such a dominant force, so he opted to retain some plausible deniability by writing in vague, symbolic terms. Pagels also contends that though John was a follower of Jesus, he still considered himself and Jesus’s teachings Jewish, and feared that the developing schism from the existing Jewish Church would lead to a violent reckoning. Pagels explains in an interview with PBS that several centuries after its writing, in an ironic twist, Revelation’s powerful imagery was repurposed by a bishop named Athanasius to threaten those who would taint his vision of a pure, singular orthodox Christianity – just the thing it was originally written to discourage. Elaine Pagels discusses the lives stories can lead beyond their writers’ imaginations and the particularly storied life Revelation has lived on August 20th at the Cowell Theater. You can reserve tickets, get directions and sign up for the podcast on the Seminar page.